A couple of years back I designed a theme that was centered around a business website. A theme that has a featured slider in the homepage, nice sharp edges, subtle backgrounds and slight gradients. It was called Eureka. The theme went for sale in Themeforest – and it did pretty well the first several months – but finally reached its non selling point. Today I’m giving this theme away for free. The .psd files are also FREE and is a separate download). At first look, you will fall in love with Eureka’s balanced design. A solid black header with just enough room for your logo and page navigation. The large feature slider will sure get your message out: loud and clear. The sharp containers that house the posts and sidebars are classic and well crafted. 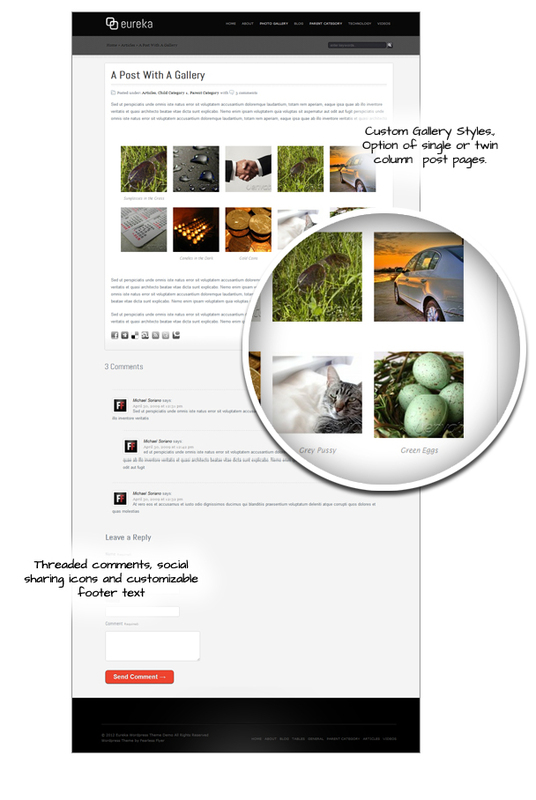 You will notice the comments area, social buttons, icons and footer – all complete the design as part of the whole. Your visitors will love your website – and for that, will want your business. Give Eureka a try. 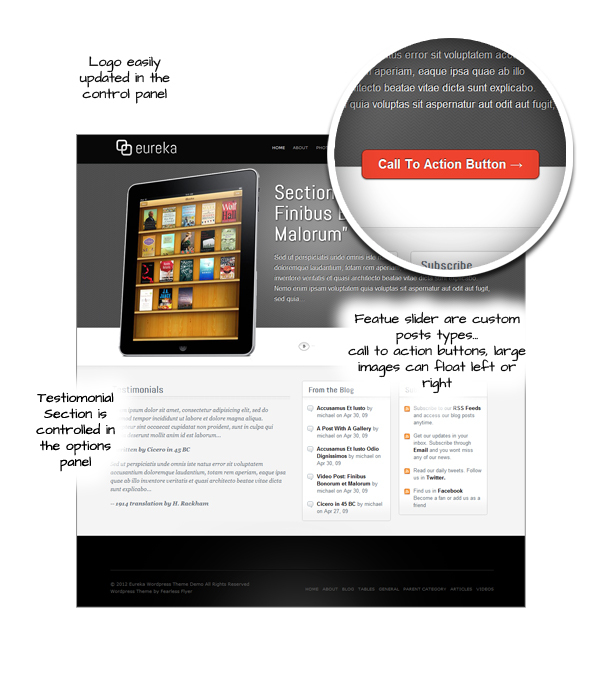 Theme options are available to make it easier to customize Eureka. Note that you don’t have to know web design to use this template. Most of the controls are in the admin section – under Appearance > Theme Options. Additional documentation can be found in this series of posts. Download the theme from this link and don’t forget to leave a comment below. good theme . nice work! Does it have a option for pages to use full width, as in no sidebars? No it doesn’t – sorry. Clear, ifnromaitve, simple. Could I send you some e-hugs?